Deep wine purples, dark plum, goldenrod, greengold, mauve. It really looks like a beautiful sari. 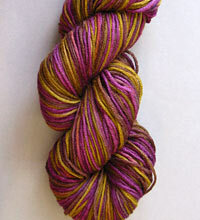 The regal silk in this colorway is gorgeous too..